Droyd Cantina: Google Currents Not Available For Europe? Google Currents Not Available For Europe? Okay, now it's getting ridiculous. 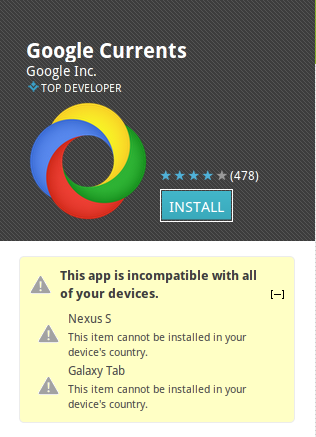 You can't install Google Currents, the Flipboard-Killer, because you live in the "wrong" country? Google is doing a good job of upsetting users around the globe. You can argue on Google Music, because it's license-problems. You can argue with the sense of releasing some shopping-apps or the Google Books app. But seriously, a news reader? What do you think people all over the world are reading on the web? The Bavarian Lederhosen-Magazine? Dear Google, yes, most of them can read English. And while it's annoying that Android apparently can't convince the Flipboard-developer to make that app available for anything else than the iOS, you do not even allow people in Europe to install your product? I'm a bit angry about that. What's the point? Maybe it's a mistake. But this may not happen. It's ridiculous and a shame for the international Android-users. This local madness has to be addressed. If you leave the users in other country as 2nd class, maybe the look for other companies, that treat them 1st class.